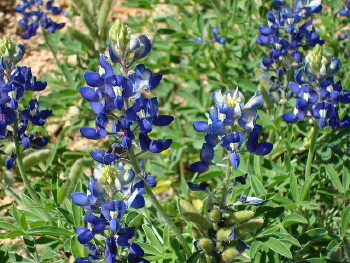 WEST HOUSTON BLUEBONNETTES was picked as the name for our club to easily locate us (west of Houston) and to honor the Texas state flower (bluebonnets). To understand the modification in spelling and pronunciation, think of the word "kitchenette" to mean a small kitchen. Bluebonnettes means a small group of bluebonnets. Our club combines recreation, performance, and competition, serving mostly newcomers, novices, and a few intermediate synchro swimmers. Workshops and mini-workshops are currently the most common form of “classes” to allow individuals to enjoy the fun of learning without demanding long-term commitment. We sometimes go weeks or even months without any workshops or practices at all, and when we have regular practices, those last for 1-2 hours once per week. We do schedule additional practices 2-3 months before participating in shows and competitions. Our focus is on nurturing individuals and families as they grow, learn, and develop aquatic skills and interpersonal skills relating to synchronized swimming and to life. We do not focus on building elite-level athletes in our club. Rather, we impart a strong foundation for a very broad range of basic skills that will prepare some to become elite-level athletes after they move on to other clubs. In addition, we hope to foster future supporters and builders of our beloved synchronized swimming. bluebonnets image by CC Rogers, CC-BY license, via Flickr.